It is suitable for use in Euro 1, 2, 3 and Euro 4 engines that do not require a low SAPS oil; where a low SAPS oil is specified we recommend Vanellus Max Drain Eco. Vanellus Max Drain 10W-40 is approved by European manufacturers for use at maximum oil drain intervals. 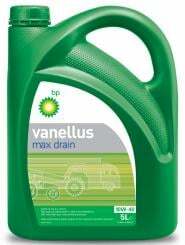 Unbelievable price on Vanellus Max Drain 10W-40 is a heavy duty diesel engine oil in Kuala Lumpur (Malaysia) company BP Asia Pacific (Malaysia), Company.